Maybe it’s because I’m in Arizona right now and the temperatures are already hitting the nineties every day, but lately I’ve been thinking a lot about summer travel. For the most part it’s fun to plan where we will go and think about the great things we’ll see, but for us, traveling in the summer is a necessity in order to escape the unrelenting southern Arizona heat. First off, if you have delicate pets or humans traveling with you, don’t mess around: get a campground with 30-amp or 50-amp power and plug in. This may necessitate a change in plans and you might end up somewhere you don’t want to be, but the blessing of cool air blowing in from the A/C will make it all worthwhile. I find that a lot people are surprised to discover the limitations of a single air conditioner on a 30-amp plug. 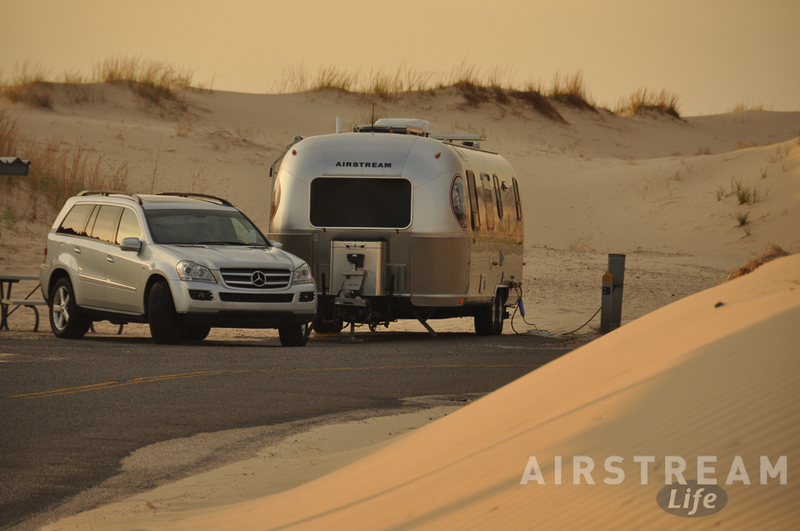 If you’ve got a newer Airstream with dual air conditioners (and a 50-amp plug) you can deal with just about any level of heat. But a single A/C definitely has limits. The A/C will generally cool the incoming air by about 20 degrees, but that doesn’t mean your trailer will be 20 degrees cooler if it’s sitting in the sun. In our 30-footer, for example, a sunny 100-degree day means we’ll experience indoor temperatures in the low 80s, at least until the sun goes down. So it’s useful to park in shaded campsites, preferably not in asphalt parking lots (green surroundings = cooler air), and be realistic in your expectations. If the trailer is over 100 degrees inside when you arrive, it’s going to take a while before the air conditioner can remove all the latent heat that is stored in every object in the interior. To cope, try to spend the few couple of hours somewhere else (like a restaurant or visitor center) while the air conditioner does its job. Don’t even dream of using the stove or oven—the burners can output much more heat than the air conditioner can remove. If you have a microwave use it instead, or go out for dinner, or cook outside, or eat a cold dinner. Water, because you need to stay hydrated and a quick cool shower once or twice a day will go a long way toward keeping your body comfortable. In desert boondocking situations you can even soak towels and place them strategically around the trailer for evaporative cooling. We bring a few gallons of extra drinking water when we’re heading into a boondocking site in the summer. Electricity, because you’ll use a lot more battery power than usual with the vent fans running constantly. A single Fantastic Vent (the kind installed as original equipment in Airstreams including motorhomes) might draw about an amp of power, which isn’t much for short durations. But with two of those fans running around the clock for a weekend, you’re looking at something in the region of 90 amp-hours, which is going to overwhelm the typical 2-battery setup in an Airstream trailer. You’ll need solar panels or a generator, and/or a much larger set of batteries. 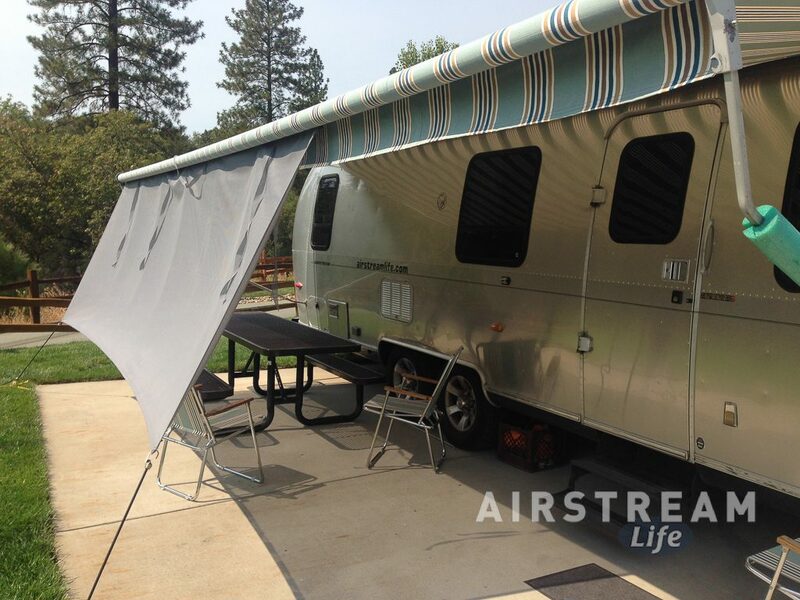 The Zip Dee awning that came with your Airstream trailer (or the equivalent awning on a Nest, Basecamp, or Interstate) can make a big difference if it’s on the south or west side when you park. Definitely deploy the awning as much as you can to shade that side of the rig. A Zip Dee Solar Shade is a huge help too, when the sun is beating down on that side of the trailer, especially when the entry door is facing west. The Solar Shade broadens the shady patch in the afternoon, when it really matters, and gives you a nice outdoor space that you otherwise wouldn’t enjoy on a hot day. In an Interstate motorhome, you may find that the Mercedes dashboard air conditioning isn’t quite enough when traveling on the highway on a 100+ degree day, especially for any back-seat passengers. Sometimes you need to fire up the onboard generator so that you can run the roof air conditioner as you go. It might seem weird but it’s OK to do this. When you’re parked, you will probably discover that you don’t need to turn on the water heater. Often the fresh water hose lying in the sun, combined with warm water in the tank, will be plenty warm for showers. But there’s a downside to this: not all water hoses are rated for “hot water” use. Cheap-o hoses made of PVC or other plastics may leach chemicals when laying in the sun all day filled with hot water. That’s why we switched to drinking water hoses that are rated for hot water use. Keep an eye on your refrigerator as well. Often, RV refrigerators don’t have great ventilation and so heat can build up in the refrigerator compartment (the space behind the refrigerator). When the air temperature around the refrigerator’s cooling fins approaches 100 degrees—which is very common in the enclosed compartment, even when the outside temp is much lower— the result is warm food in the refrigerator. To combat this, keep the fridge door closed, and if you need to get something be sure to get it quickly. It’s not like your home refrigerator that has a big compressor and can recover its coolness in a few minutes. Each time you open that door it can take hours to recover fully on a hot day. Also get a wireless temperature monitor so you can check the interior temp without opening the door. You can get two of them and monitor the freezer as well, but I’ll tell you right now that if the fridge starts to climb above 50 degrees, whatever is on the door of the freezer will probably start to defrost. (Pack your ice cream and seafood in the back.) These wireless monitors are available from many sources and they’re not expensive. If you camp in hot weather a lot, with or without air conditioning, consider having a set of electric fans installed in the chimney of the refrigerator compartment. These things are amazingly effective at moving the hot air out of the fridge compartment to help the refrigerator cool down. We switch our fans on every day that the outside temperature is above 85 degrees. Some Airstreams come with those fans, but most don’t, and I think they’re a must for serious summer travelers. We’re going to work on a kit for the Airstream Life Store later specifically to solve this problem. Finally, as you travel on hot days you need to be extra aware of the condition of your tires. They are much more susceptible to problems and wear on hot days. When the air is 95 degrees Fahrenheit, the highway surface can easily be 120+, and the air inside the tires will often exceed 140 degrees at highway speeds. That’s brutal on tires and it shortens their life. This is just one of several reasons I strongly recommend a good tire pressure/temperature monitoring system. Blowouts and other failures are far more likely on hot days, and you want to know right away if something goes wrong before it does additional damage. If you don’t have a tire pressure monitoring system you should make a habit of visually inspecting all the tires at every stop, and checking air pressure frequently.